3 Climber Mobile Hard Rock Wall - Portable Hardrockwall Rentals - 3 Climber - Our 25', 3 Climber Hard Rock Wall is great for both kids and adults. Talk of the Town, Gaithersburg, MD. 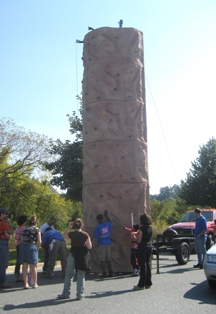 3 Climber Hard Rockwall - Our 25', 3 Climber Hard Rock Wall is great for both kids and adults. It is invigorating, challenging, and most importantly, safe because of its auto-belay system. This event is great for Team Building, Company Picnics, School Events, and Community Festivals. Includes: Wall, harnesses, auto-belays, and 2 attendants. Space: 27'l x 8'w x 25'h and 26'l x 9'w trailer must be driven into place. If you like the Hard Rockwall, you may also be interested in these party rentals: Tiki Island Rock Wall & 5 Climber Rock Wall.